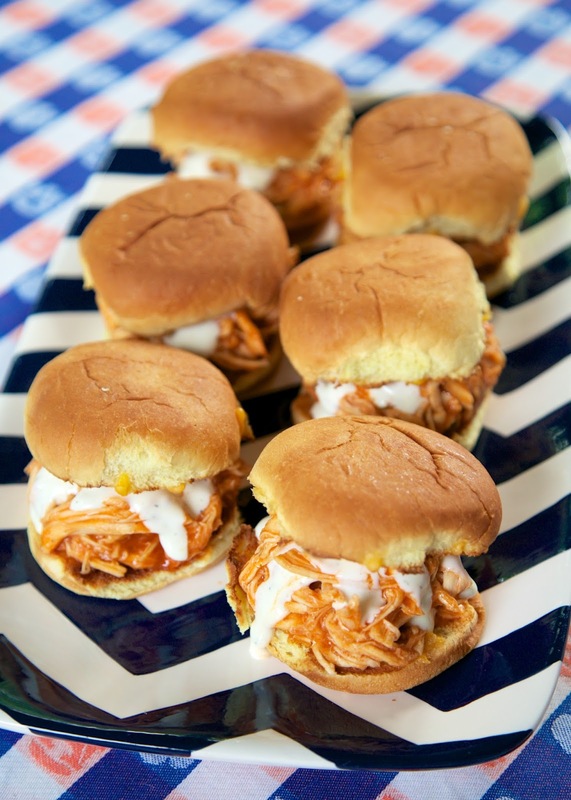 Slow Cooker Buffalo Chicken Sliders - only 3 ingredients! Chicken, Buffalo sauce and Ranch! These things are SO good! GREAT for tailgating. Can serve on buns, nachos, tacos or on top of a salad. Can freeze leftovers! Are you working on your Super Bowl menu? 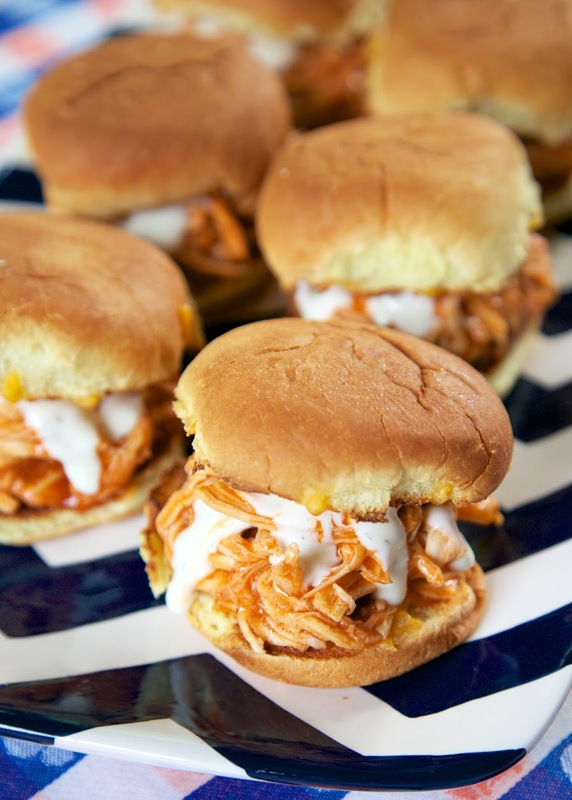 Well, these Slow Cooker Buffalo Chicken Sliders should be on it! Chicken breasts slow cooked with buffalo wing sauce and Ranch dressing mix. Super simple and super delicious. This would be great for a Super Bowl party. People could assemble their sliders right out of the slow cooker! We opted to serve the Buffalo Chicken on slider buns with some melted cheddar cheese and Ranch dressing. The cooked chicken would also be great on nachos, in tacos, on top of a salad or big hamburger buns. I like to make the chicken and put half of it in freezer bags for a quick dinner later. Anyway you decide to serve this Slow Cooker Buffalo Chicken, I guarantee it will be a hit! Place chicken, wing sauce and Ranch dressing mix in slow cooker. Cook on LOW for 4-6 hours. Remove chicken from slow cooker and shred. Return to slow cooker and cook on LOW for an additional 30 minutes. When ready to served. Top half of buns with cheddar cheese. Place under oven broiler until cheese is melted. Top buns with chicken and prepared Ranch dressing. We love this. We add 8 oz cream cheese after shredding and its creamy! We also use franks buffalo sauce instead of the original. You must try it! These babies look super good and so easy to prepare - perfect game food. Easy and delicious! That is perfect game day food in my book too! Absolutely fantastic. It is impossible to stop eating these. I didn't change a thing, which is unusual for me. Great post! Thanks! Question: Your recipe says 'Serves 8', but then also says to use 12 slider buns. Is this enough for 8 or 12 sliders? Thanks in advance! I figured some people would eat more than one slider. There is definitely enough for at least 12 sliders - maybe more just depending on how much chicken you put on top of each bun. Do you put thawed chicken breasts in the slow cooker or frozen? either is fine. I used thawed chicken because that is what I had on hand. I have to toast the buns really well, so that the bread doesn't get soggy (I'm weird like that). Yes I would like to know also. I hate ranch. Is the 1/4 cup ranch from a bottle of ranch, and used to top off the sandwhich? Do you mix everything together once it's put in the crock pot? Or just leave it how it's placed?